This article was originally published on November 27, 2014, on the American holiday of Thanksgiving, by Haaretz. The full article can be found on their website here. The Jewish community, once pilgrims ourselves, must embrace those who enter our lands in search of new beginnings and opportunities. As a child, every Thanksgiving I would read the children’s book “Molly’s Pilgrim” by Barbara Cohen, that inspired the 1986 Academy Award-winning short film of the same name. Now, even as an adult, I refer to the book as a reminder of the true meaning of Thanksgiving in America. The children’s book and film tell the story of a young Russian Jewish immigrant named Molly, who came with her family to America to escape religious persecution. Molly’s teacher assigns her entire third grade class to make Pilgrim dolls as part of their Thanksgiving project. Every other child brings a doll to school dressed in mostly white and black hats, colors, and cuffs – the dress that we generally associate with the Pilgrims of America’s Thanksgiving narrative. Molly, though, brings a doll to school, dressed in clothing associated with her home in Russia. She teaches the class that in every generation, in all places, there are pilgrims, immigrants who search for a new home, a new life, a new opportunity and a newfound freedom. The traditional Thanksgiving narrative tells the story of a feast and celebration in Plymouth, now Massachusetts, in 1621 following a good harvest. The story, while poorly documented and likely inaccurate, tells of the Pilgrims and Puritans breaking bread with the Native Americans, who embraced them peacefully and taught them how to cultivate the land and survive the harsh winter, before these new immigrants turned around and later savagely slaughtered so many Native Americans. The message of this story – true or not – is one of embrace. We embrace those who are new in our midst. We welcome them with open arms. We understand the desire – and God-given right – to be free and the journey that so many pilgrims take in order to be free. Last week, U.S. President Barack Obama announced that he would use executive action to reform immigration in the United States. Some may question the method of executive action, but attempts at real reform have been stuck in a gridlocked Congress for years. Regardless of the method, the Jewish community must support such reform. 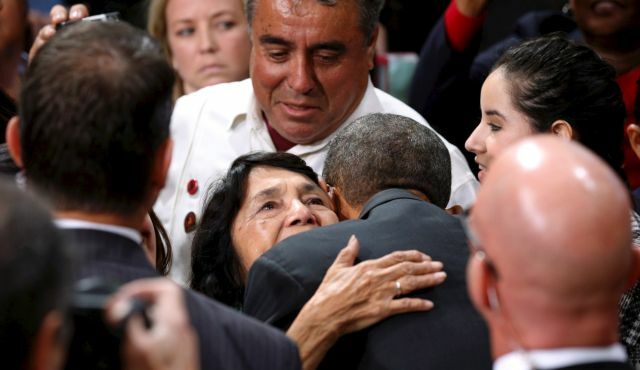 Such executive action extends temporary legal status to almost 5 million undocumented immigrants. This is not granting citizenship. This does not give them a green card. However, this ensures that millions of parents are not deported and separated from their children who were born here and are citizens of this country. Additionally an estimated 330,000 dreamers,330,000 pilgrims, undocumented immigrants who came to America as children, will be eligible to stay in the United States under the Deferred Action for Childhood Arrivals program. The Jewish community is a community of pilgrims. The Torah (Deuteronomy 10:19) reminds us that we must embrace the stranger for we were once strangers. Our communal history, our communal narrative, speaks of wandering. We did not only wander for 40 years in the wilderness. We wandered in exile from country to country for 2,000 years before pilgrims, pioneers, returned to the land of Israel. And during those 2,000 years, we also became pilgrims in every country we settled. We were pilgrims at the turn of the 20th century that saw large waves of Jews emigrating from Eastern Europe to the United States. We were pilgrims when we left the former Soviet Union and Ethiopia. Since we were all once pilgrims, we must embrace all other pilgrims, all immigrants who enter our lands in search of new opportunities and new beginnings. As a Jew living in America, I wrestle with which identity comes first: Am I an American Jew or am I a Jewish American? The truth is that both identities are intertwined. During Thanksgiving, we have the opportunity to give thanks for our new beginnings in our land of opportunity – for we were once strangers in a strange land. This year, may we pray that millions of pilgrims, millions of immigrants, will be able to stay in this country that they call home. May we strive to break bread with them, too, for we all have much to be thankful for. Thanksgiving is arguably the most “Jewish” of all American holidays. This is not only because of the link between Thanksgiving as a fall harvest holiday and the Jewish holiday of Sukkot, mentioned often in scripture. Thanksgiving is authentically Jewish because at the core of Judaism, Jewish practice, and Jewish ritual is the act of giving thanks. Unlike American tradition which designates a day for giving thanks for those things that we otherwise take for granted, Judaism ritualizes this process on a daily basis. We offer blessings of thanks three times daily in the Amidah prayer. In fact, the rabbis teach that we offer one hundred blessings a day, one hundred opportunities to give thanks, one hundred opportunities to express gratitude for the everyday miracles in our lives. Doing so ensures that giving thanks is not about turkey or football, but rather about true gratitude for what we have. However, the act of giving thanks cannot simply end with gratitude. Giving thanks — appreciating what we have — must lead to helping others who do not experience the blessings that we too often take for granted. This includes helping those in need by providing food, goods, and services to those less fortunate. But this also included being a voice for justice and equality, standing up for those who God-given dignity and rights are being neglected or taken advantage of. Giving thanks must lead to helping others. Giving thanks must lead to action. Giving thanks is about seeing the Divine spark, seeing God, in each individual. This past Shabbat, we read in the Torah portion, Parashat Vayetze, of Jacob’s dream. Jacob dreams of staircases from the earth all the way up into the Heavens. The text says that angels of God were ascending and descending up these staircases. Messengers of God, those made in God’s Divine image, were going up and down. Jacob awakens and realizes that “God was in this place and I did not know it.” For the first time, Jacob the selfish becomes Jacob the selfless. Jacob realizes the Divine spark in each individual, that God is all around us because all those made in God’s image are all around us. Thus, to give thanks to God is to give thanks to each other. And we cannot truly express our gratitude to the Divine if we do not also work to ensure that all those made in God’s image have a great deal to be thankful for. Giving thanks must lead to action. Doing so, allows us all to pause, reflect, and appreciate God’s blessings. 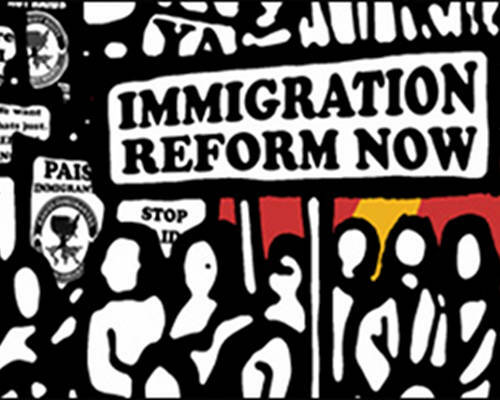 It initially looked like bipartisan immigration reform would happen in 2011 or 2012. This was delayed because politicians were more focused on getting elected than making change. A bipartisan immigration reform bill came to the floor of the house in 2013, after it overwhelmingly passed in the Senate. It has since been stuck in the gridlock that is the United States Congress. President Obama seemed determined to act on immigration reform this fall, but was pressured by leaders of the Democratic Party to again wait until after the recent midterm elections. They were concerned that such action would have an impact on close races. Pundits now suggest that such inaction was in fact what kept the Democratic base away from the polls on election day. Many news outlets have been suggesting that President Obama will act as early as this week, using his executive authority to change America’s immigration policy. Such reform would not be citizenship and would not be issuing green cards. Rather, it would be an opportunity to breathe a sigh of relief for some five million members of society who live in the United States and work in the United States, who identify as American even if they were not born or raised here, even if they are not citizens. Such action would ensure that these five million individuals are not deported and separated from their children who were born here and are American citizens. This past week, we read Parashat Chaye Sarah, the Torah portion of Chaye Sarah. The Torah reading begins with Abraham, in Hebron, attempting to find a burial site for his recently deceased wife, Sarah. He ends up buying Ma’arat HaMachpela, the Cave of Machpela, and burying her there. What is so interesting to me is why he chooses Hebron, in the biblical land of Canaan, as the burial site for his wife, and eventually himself as well. He only recently journeyed to Canaan, to the land that God promised to show him, and yet, it felt like home. It was the destination of his journey. It was where he believed things would be better. He was not a citizen of the land. He was not truly settled and familiar with his surroundings. Yet, he dwelt there; he considered it home. He did not return to his birthplace of Ur Kasdim to bury Sarah, or to Haran where they had settled for many years. He chose Hebron, and in Genesis 23:4 he referred to himself as a Ger Toshav, a resident alien, there. A stranger. A dweller. Someone who feels at home even if others treat him as an outsider. Abraham remarkably identifies himself as a Ger Toshav. The Hittites, even more remarkably, welcome him in with open arms, offering him land before Abraham insists on buying it. I have my opinions about the President using executive orders to change policy. I also have my opinions about the United States Congress doing its best to never pass any legislation. Regardless of how immigration reform is passed, I think it is important that we remember that our patriarch Abraham referred to himself as a Ger Toshav, as a resident alien. We cannot ignore, neglect, or dehumanize the Ger Toshav among us. We are commanded to welcome the stranger more times in the Torah than any other commandment. With each command, we are reminded that we were once strangers in a strange land. That is true for the Jewish people. That is also true for American society. The beauty of America is that it is a country full of immigrants, a melting pot of different ethnicities, races, religions, and cultures, each coming to this country with a belief that it would bring about new opportunities. We were each once a Ger Toshav. In some ways, we all still are. Just as the Hittites did with Abraham, we have a responsibility as Americans to welcome in those immigrants in our midst, who are a part of our culture, our society, and our workforce, regardless of how they arrived in this country. The past several weeks, events in Israel and Jerusalem have been challenging, troubling, and scary. This comes only months after a ceasefire following a summer-long war in Gaza. The attempted assassination of right-wing Temple Mount advocate Yehuda Glick, and in turn, the killing of the man who tried to murder him, sparked violence at the Temple Mount. This also led to scary terrorist attacks in Jerusalem, with terrorists using their cars as deadly weapons, ramming the car into a train platform and killing two. The response following these tragic events from Israeli leaders have suggested that they no longer see peace as a possibility or as a priority. Jerusalem Mayor Nir Barkat has called on Israeli police to use “aggressive force” against Arabs who are protesting. He believes that this is the only way to end the wave of violence. I, on the other hand, believe that such force only adds more fuel to the fire. Additionally, last week, MK Naftali Bennett, arguably one of the most powerful political leaders in Israel and a threat to Netanyahu’s premiership, wrote an Op-Ed in the New York Times, declaring that a Two-State Solution in no solution at all. Prime Minister Netanyahu added this week that Mahmoud Abbas incites violence against Israel and is not a true partner in peace. What worries me is that, based on the comments of Netanyahu, Bennett, and Barkat, it seems Israel has given up on peace as a priority. 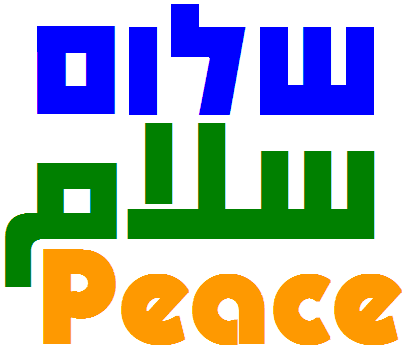 Now more than ever, peace must be a priority. Now more than ever, we must work towards peace. I am unsure what the term “partner of peace” means. We do not make peace with our friends. They are already are friends; peace is unnecessary. We make peace with our enemies. Thus, especially during these heightened moments of violence, we must do even more to pursue peace. Just as we learn in Pirkei Avot, we must be disciples of Aaron the High Priest and not just love peace, but truly pursue it. Yet, while Israeli officials and Palestinian leaders refuse to make peace a priority, it is reassuring to find a sliver of light at dark moments in our history. I am proud of my mother, Sheryl Olitzky, and the work she does with the Sisterhood of Salaam Shalom, an organization geared towards bringing Jewish and Muslim women together to shatter stereotypes and work towards peace. While Israeli and Palestinian leaders seem to have given up on peace as a priority, these women came together on November 2nd for their first conference at Temple University, committed to being change agents, committed to dialogue, committed to understanding, committed to peace, committed to making this world a better place. After all, we once lived in peace alongside each other. It was only the external factors, the pressure of those around us that altered such a sense of harmony. Jewish tradition teaches that we are descendants of Abraham’s son Isaac. Many in Islamic tradition believe that Muslims are descendants of Abraham’s son Ishmael, with Ishmael serving as a forefather to the prophet Muhammad. Two peoples descended from brothers, from brothers who enjoyed playing together. Sarah saw the son whom Hagar the Egyptian had borne to Abraham playing [with Isaac]. Out of jealousy, Sarah kicks Hagar and Ishmael out of their home. Ishmael and Isaac loved each other and played with each other. Chapters later, despite such a separation, they even reunite and re-embrace to come together to bury their deceased father. In their innocence, before they could be influenced by the outside world, they peacefully play together. Our rabbinic commentators are so uncomfortable about Sarah kicking Ishmael and Hagar out of their home for “playing” that they try to reinterpret to word “playing” as something else entirely: attempted murder, sexual assault, idol worship. Such commentary only reinforces the simple beauty of these two boys – two fathers of two nations and faiths – playing together before they are forced apart by outside factors and peer pressure. At our core, we are still brothers and sisters. Our goal is to get back to a point where we can sit together and play together again. That is what the Sisterhood of Salaam Shalom achieved last week and continues to work towards. That is the work – the hard work, but necessary work – that Israeli and Palestinians leaders have given up on. I hope and pray for a time when all of our children can sit and play together, just as Ishmael and Isaac once did. I hope and pray for leaders who, even in the face of violence and hate, will be committed to seek peace, will be committed to a two-state solution, and will be committed to harmony. I pray for leaders who will be brave enough and courageous enough to work towards peace even when it is not popular, even if it won’t get them reelected. I pray for leaders who will remember that at our core, in spite of such terror and violence, we are brothers. May we return to a time when we can play together again, and may the time come speedily in our day. Last week, I added my name to a letter signed by clergy across faiths and religions in solidarity, urging Congress to pass the Voting Rights Amendment Act of 2014. The letter, prepared by the Jewish Social Justice organization Bend the Arc, urges Congress to pass this amendment and restore the mechanisms of the Voting Rights Act, mechanisms that they Supreme Court got rid of last year. Thus, the upcoming election day, Tuesday November 4th, will be the first election day in this country in over fifty years without the full protections of the Voting Rights Act. Voter disenfranchisement troubles me. Scare tactics and stumbling blocks — including special ID cards — make in near impossible for some American citizens to fulfill their duty, obligation, and opportunity as Americans and vote. What is equally troubling, maybe even more troubling, is that so many of us who do not have such stumbling blocks in our path, choose to stay home on election day. The 2008 election saw over 70% of eligible voters head to the voting booth. In 2010, the last “midterm” elections, only 42% of eligible voters actually voted. 58% of eligible voters did not cast a ballot. Many in the news media think that turnout on Tuesday will be even lower. 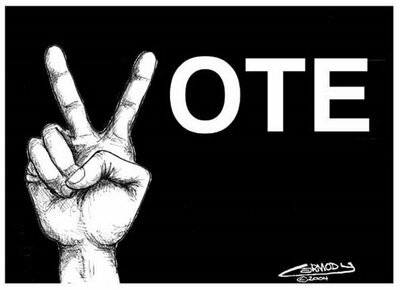 Some of us may not vote because we think our vote is only one vote and a single vote does not matter. Others may stay home, fed up with the gridlock in Washington, annoyed by the lack of productivity of our representatives. However, as I wrote previously, we have a Jewish imperative to vote. We have a responsibility — as keepers of Torah, as those who strive to make the ethics and morals of our tradition reality for all of God’s creations, as those who see the Torah as a tree of life because it is a guide in our lives — to vote. Voting is taking a leap of faith. Like Abram who began his journey in Parashat Lech Lecha, the Torah portion of Lech Lecha, which we read about this past Shabbat, we go on a journey, even if we do not know where exactly we will end up. God promised Abram in Genesis 12:1 that God would take him to a land yet unseen. He did not know where the journey would take him. He did not know what the final destination would be. But he still took the journey. We vote for candidates, on the local, state, and national level, that we think best represent our ethics and values. We do not know what they will achieve once they are elected. But we still take to journey. To refuse to vote, to refrain from voting, to be apathetic towards the democratic process is the equivalent of Abram settling and remaining in Haran. Voting is a sacred experience, a sacred journey. Even if we do not know where we will end up, may we be brave enough to take the journey. May we do our duty, may we fulfill our responsibility, and vote. Amichai Lau-Lavie of Lab/Shul compares the voting booth to the Holy of Holies, for it is truly a sacred space, an act in which become a little bit closer to the Divine. May we take the act seriously, and may we appreciate the holiness of this journey. No matter what political party you affiliate with, no matter what candidate you support, don’t forget that election day is a holy day. Don’t forget to vote. On October 11th, National Coming Out Day, Congregation Beth El welcomed Luciana Arbus-Scandiffio, a student at Columbia High School, and a member of COLAGE: Children of Lesbians and Gays Everywhere to share with our community what NCOD means to her and her family. That Shabbat morning, was also Shabbat of Chol HaMoed Sukkot, the Intermediate Sabbath of the Sukkot Festival. The imagery of Sukkot also speaks to the importance of us as a congregation and as a Jewish community continuing to celebrate National Coming Out Day. The Sukkah, the temporary dwelling place, the hut, that we build and sit in during Sukkot, is reminiscent of God’s Shelter of Peace that we seek. It is represent of a Safe Space, a space where we can be who we are, to come as we are, and to acknowledge that keudsha – the sanctity – in each of us. But the Sukkah is also fragile. It only takes a hard rain to knock the s’chach, the branches uses as a roof, down. It only takes a strong wind to blow the sukkah over entirely. The sukkah reminds us that that sense of peace, safety, and security is fragile. We must constantly, as individuals and as a community, proclaim that we are a shelter of peace for all those seeking. We must constantly come out – be it as a member of the LGBTQ community or as in ally – to ensure that there is always a sukkah, a dwelling place here for all who seek. Hi I’m Luci, I’m a 16 year old junior at Columbia High School and I have 2 gay moms. 26 years ago, to commemorate the anniversary of the National March on Washington for Gay & Lesbian rights, National Coming Out Day was born. Today is that day, and it’s all about coming out and identifying yourself with pride. Coming out commonly refers to identifying as LGBTQ yourself, but as the daughter of 2 lesbian moms, I can attest that coming out is also about speaking openly about my family. Living in Maplewood almost my entire life, I think of this as an incredibly unique place. Some of you may have saw it but there was actually a New York Times article about Maplewood the other day, saying that “If Brooklyn Were a Suburb…”, you guessed it, it would be Maplewood. I think this attests to the Maplewood/South Orange community as a whole. We take pride in our liberal politics, our cute, small town feel, our truly special environment. And as I’m sure you’d agree, the Maplewood/South Orange community is a great place to live. I certainly consider myself lucky. Having gay parents isn’t particularly rare here and with gay marriage finally legal, a common misconception is that having gay parents, is no big deal. But even here, in this liberal, suburban utopia, having gay parents isn’t without its challenges. As an awkward and shy 4th grader at Clinton Elementary school, I had the assignment to draw a picture of my family. It didn’t seem like a big deal at first, but upon realizing that my poster would be hanging in the hall for everyone to see, it dawned on me that this project was much bigger than it seemed. It was, by definition, an announcement of my gay family. At that point I was already pretty open about my moms- all my friends knew, it was no shock when they came over to play at my house, no surprise when my moms picked me up from school, but still, not everyone knew. And okay, so maybe not everyone would even see my poster, but it felt like something I could never go back from once I put it out in the world. That weekend I sucked up my courage and made my poster- with me, my 2 moms, my cats, and my frog (who I had actually grown as a tadpole in the 2nd grade, and who is still alive today, much to everyone’s surprise). The act of making the poster wasn’t so bad, but presenting it in front of the class was less than ideal. I got some strange reactions: I could see it on people’s faces that they were confused and uncomfortable. Not everyone of course gave me those funky, raised eyebrows, I had a good amount of friends in that class, but it was still uncomfortable and scary. I had never looked face to face with someone who thought my family was “weird” before-this was my first encounter with homophobia. Never before had I felt isolated from my peers in such a unique, untalked about way. I was also increasingly aware that my teacher, when talking about families, never mentioned a family that looked like mine. It was all about moms and dads. In the days that followed, my parents had a conversation with my teacher about my concerns- it proved helpful. My memory of elementary school continues along essentially tension free in regards to my family, but just because this was over didn’t mean I ever lost that feeling of being “different”. I still feel different. Having gay parents will always make me different, but when accompanied by a sense of courage and community, it feels a lot less lonely. What’s really helped me has been my involvement with an organization called COLAGE- an organization for kids with one or more gay parents. COLAGE is run by young adults who have LGBTQ parents. As their mission statement reads, “COLAGE unites people with lesbian, gay, bisexual, transgender, and/or queer parents into a network of peers and supports them as they nurture and empower each other to be skilled, self-confident, and just leaders in our collective communities.” They have done nothing short of this for me, being part of COLAGE has solidified my identity as a daughter of 2 moms, and made me an ally for the LGBTQ community as a whole. Here, in the Maplewood/South Orange community in particular, I hear a lot of “oh, it’s not an issue” when it comes to gay parents explaining why their kids don’t need something like COLAGE. What people don’t understand is that it doesn’t have to be a problem for someone to benefit from a supportive community of people just like them. And there is something unparalleled in COLAGE’s mission to empower the kids of LGBTQ families- no other organization like this exists. There is nothing like that sense of community that arises from meeting other kids with LGBTQ parents. It’s such a legitimizing experience- it’s like “oh, everything I’ve ever thought and felt has happened to someone else too”- it’s automatically validating. You never see kids like us gathered together, it creates a true sense of unity, it creates a safe space for people to share their stories in a way that exists no where else. Let them come to you. Forcing someone to share what they’re not comfortable with is counter productive, especially with something this sensitive. But if you feel like there really is a problem- some issue of bullying- try to prompt your kid into opening up, gently. Always ask how their day is, everyday, if maybe you don’t do so already. I like to think that if there is an issue, that it will come out sooner than later. But sometimes, your kid might not want to talk you about it. As long as your child can open up to someone- a friend, a relative, a teacher, a, guidance counselor, talking when comfortable is really the only way. For me, talking to older COLAGErs was invaluable. They were older, therefore infinitely cooler, and they had gone through the same thing I was going though. And like most things, acceptance comes from within. You can’t be taught to be proud of your family, that sense of spirit comes with time. Being an ally of the LGBTQ community is incredibly important. All great movements need support from people who are ready to take action, and as an ally, it’s your job to stand up and support the rights of LGBTQ people. We all need to see images of ourselves in the world. Often, gay families are not reflected back at us- they are underrepresented in the media and our attitudes. As a child, always hearing “have your mom or dad sign this permission slip”, and reading books about kids with straight parents, it furthered my feeling of being different. I think schools in our district have been slow to make changes. As allies, it’s our duty to work for the inclusion of LGBTQ people and families into the school environment. We need to advocate for teachers teaching with a language that is inclusive of our families- we need to rally for more books in the library about kids with gay parents, and books about kids who identify as LGBTQ themselves. We need to reverse our heteronormative curriculum and makes schools a safer space. With gay marriage legal in New Jersey- people are often believe that homophobia is no longer a problem here. We need to continue our struggle for equality with passion and determination. I am so happy to no longer be complaining that my parents can’t get married. My parents have been together long before gay marriage was legal anywhere in America- long before gay marriage seemed like a possibility. They were even at the original march on Washington 26 years ago. We’re loosely, planning a wedding (the date has yet to be announced, for we are a family of procrastinators), but my moms have chosen to call it something I find incredibly appropriate, as it speaks to their long, committed relationship : “A Wedding to Celebrate 30 Years of Marriage”. Thank you so much for having me, thank you so much for listening, thank you so much for supporting the LGBTQ community and thank you for being our allies. Please feel free to contact me, if you have any questions, I’m a member of COLAGE’s Youth Advisory Board. I hope to start a chapter in this community soon. 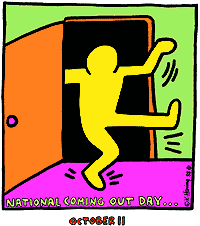 Have a happy coming out day, and thanks again. I feel blessed to be a part of such a warm and inclusive community at Congregation Beth El. Feel free to contact me for more information.